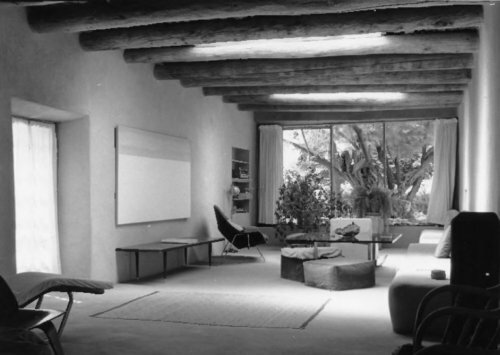 The Georgia O’Keeffe Home and Studio is a historic house museum in Abiquiú, New Mexico. From 1945 to 1984 it was the principal residence and studio of artist Georgia O’Keeffe (1887-1986). It is now owned and managed by the Georgia O’Keeffe Museum in Santa Fe, through which guided tours can be arranged. It was designated a National Historic Landmark in 1998, as one of the most important artistic sites in the southwestern United States. Portions of the house are believed to date to the 1730s, and it was in deteriorating condition when Georgia O’Keeffe first spotted it in the 1930s. At the time, it was owned by the Roman Catholic church, which did not want to sell it. It eventually relented, and O’Keeffe was able to purchase it in 1945. She undertook to rehabilitate and modernize the property, work that was a collaborative effort with her friend Maria Chabot. This work was completed in 1949, at which time O’Keeffe made it her permanent home. Included in the compound is a smaller outbuilding which was her principal studio space. The house remained O’Keeffe’s primary residence until 1984, when she moved to Santa Fe two years prior to her death at age 98. In 1989, the Georgia O’Keeffe Foundation became owner and manager of the Abiquiú property. It is now owned and managed by the Georgia O’Keeffe Museum. The property was declared a National Historic Landmark in 1998.